As the fall and spring semesters come to a close, the Baylor Alumni Network hosts the Official Baylor Ring Ceremony in Waco Hall where recipients are presented their rings by the university president. Family and friends are welcome to attend this distinctive tradition, which not only unites the ring recipients to one another but also to the university as future alumni. Alumni and students who have completed 75 semester hours are eligible to purchase the Official Baylor Ring. Graduate students also are eligible to purchase a ring after completing 18 credit hours. 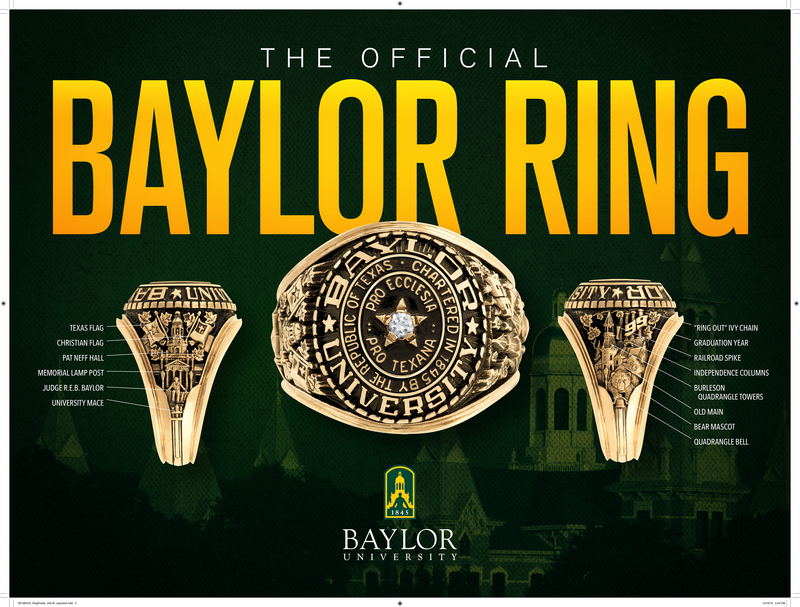 PhD students are eligible to purchase the Official Baylor Ring after completing 30 credit hours. Alumni: visit the Baylor Alumni Network, Baylor Bookstore, or order online at Balfour.com/Baylor. You may pay for your ring in full using Visa, Master Card, Discover, or American Express. Payments during Ring Week at Bill Daniel Student Center may also be made by check. Balfour provides an interest-free monthly installment plan. You pay one third of the balance at the time of purchase. The remaining balance is divided into two equal payments and is billed to your credit card in one month increments with no interest. If you have questions, please contact Jan Dodd at Jan_Dodd@baylor.edu or by phone at 254-710-1204 for more information. Protects your purchase with a limited lifetime warranty which includes free resizing, cleaning, and polishing. Includes a ring loss protection plan with your purchase. Endorses No Dirty Gold's Golden Rules; see balfour.com/about/environment. Individual numbering in each ring to provide authenticity and identify your ring in the event it is lost or stolen. All eligible students or alumni may order a ring online, call Balfour at (866)225-3687, or visit either the fall or spring official Ring Week, held at the beginning of each semester in Bill Daniel Student Center. Balfour representatives will be on campus to assist students with questions, sizing and ring orders. Eligible students are notified after the twelfth day of class each semester. Students who purchase their rings during the official fall or spring Ring Week will receive an invitation to the Official Ring Ceremony held at the close of each semester in Waco Hall. Balfour mails the formal invitation to students on the ceremony list using the address on the order form. Students also receive emails from the university with ceremony details. The university president presents each student their ring at the Official Ring Ceremony. The ceremonies begin at 5:30 p.m. and are usually completed by 7 p.m. A photo is taken of each recipient with the president as they receive their ring. These photos are available for order in the lobby after the event. There is also a brief reception in the lobby afterward. Students who do not attend the ceremony will receive an email the following morning with instructions on when and where to pick up their rings. Rings that are not picked up by the last day specified in the email will be shipped back to Balfour and then be shipped to the student's permanent address. Ring orders placed any time other than during Official Ring Weeks will be shipped to the ring recipient. Delivery usually takes 6-8 weeks. Inquiries should be directed to Balfour customer service.